The other day, I wrote about a silly mistake, where Jose Quintana threw a fastball over the middle to Trea Turner, and it was ruled ball one. It was a fluke, a freak accident, caused by Quintana missing his spot, Willson Contreras catching poorly, and home-plate umpire Fieldin Culbreth doing heaven knows what. I didn’t write it in an attempt to tear anyone down — I’m just delighted by the weird. It’s undeniably weird when a pitch down the middle isn’t ruled a strike. It’s not a good look for the game, but, outside of that, it’s always hysterical. There’s nothing normal about a pitch like that being a ball. There’s no epidemic of umpires missing obvious strikes. And as I pointed out, in the very same at-bat, Culbreth granted Contreras and Quintana two borderline strikes that might’ve gone the other way. One could argue that, even in that one plate appearance, the Cubs got a better strike zone than the Nationals did. Interesting. Forget that game. Move to another one. The Red Sox were eliminated by the Astros on Monday, after the Astros scored three late runs. So much of the focus has been on what happened later on, but the game also might’ve turned in the bottom of the second. Though the Astros were ahead 2-1, the Red Sox had the bases loaded with nobody out. 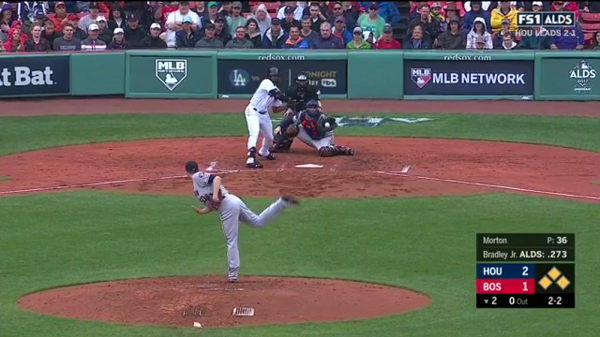 Then Jackie Bradley Jr. was called out on this pitch. 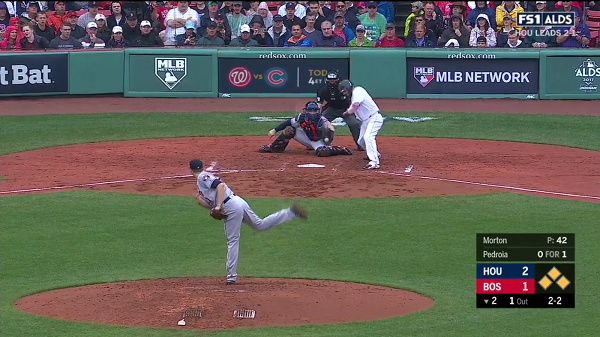 In the next at-bat, Dustin Pedroia was called out on this pitch. Neither strike was egregious, and neither strike robbed the Sox of a sure baserunner, but those are borderline calls, and probably generous calls. Pedroia was angry about it, and then John Farrell had to come out and get between Pedroia and umpire Mark Wegner. Farrell was subsequently ejected. The Red Sox fired him today. The last pitch for which Farrell was Boston’s acting manager was a questionable third strike with the bases loaded in an elimination game. I have no idea how that inning might’ve gone were the strike zone a little bit smaller. So let’s talk about that for a few minutes. This doesn’t have to drag on. 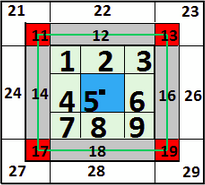 What does the normal playoff strike zone look like? That is, how does it compare to the zone of the regular season? There’s no difference with obvious strikes. There’s no difference with obvious balls. The obvious pitches are almost always called in the obvious ways. At issue are the borders. And, thankfully, Baseball Savant makes this easy to research. The site offers the ability to run queries based on a detailed zone map, shown below. The green line traces the rule-book strike zone. I ignored zones 21 through 29. Easy balls. I also ignored zones 1 through 9. Easy strikes. I focused on zones 11 through 19, which are all around the edges. I calculated the rate of called strikes in those zones, league-wide, with all taken pitches in the zones serving as the denominator. This plot shows the playoff rates, as well as the rates from the regular season, going back a decade. We’ve got 10 years. In all 10 years, you could say the rates are similar, but in all 10 years, the regular-season rate is lower than the playoff rate. On average, over the decade, these borderline pitches have been called strikes 45.3% of the time during the season. In the playoffs, the average rate has risen to 47.2%. There’s no real difference in time, no trend — over the first five years, the rates are separated by about two percentage points, and over the past five years, the rates are separated by about two percentage points. The gap right now for 2017 is 2.4 points. It’s subtle, but the playoff expectation should be that, in any given game, the pitcher will get 1-2 extra borderline calls. Why does this happen? Why does this happen when, in theory, the playoffs select for better umpiring crews? Why should the playoff strike zone get bigger, when hitting is already difficult enough? I think the explanation is actually simple and obvious. We know that, in theory, every pitcher should work with the same called strike zone. But, in practice, that’s not how it happens, because umpires are influenced by catchers, and catchers are influenced by location. A pitch that misses its spot is harder to receive, and it’s more likely to be called a ball. A pitch that hits its spot is easier to receive, and it’s more likely to be called a strike. Everyone in the playoffs is good, more or less. The average playoff pitcher is better than the average regular-season pitcher, and part of being better is possessing better command. That’s what I think this comes down to. Playoff pitchers just have superior location, so they’re better able to work the edges as they like. 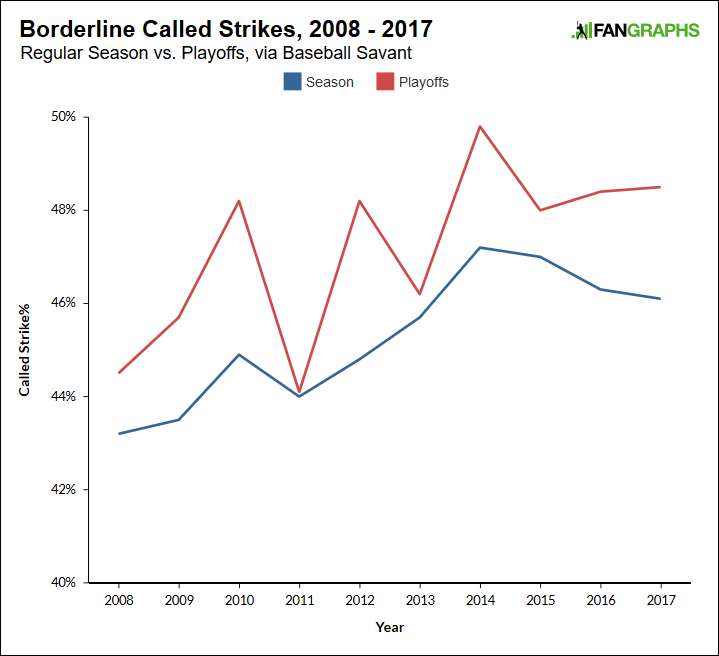 This year, the regular-season average for borderline strikes was about 46%. Weighted by playing time, the playoff pitchers this season averaged 48%. Last year, you can see the same thing. The regular-season average for borderline strikes was again about 46%. Weighted by playing time, the playoff pitchers last season averaged 48%. That is, the playoff pitchers are essentially working with their usual zones. It’s just that their usual zones are a bit bigger than we might be used to after six long months. There could be other small factors. There probably are other small factors. Maybe better framers are slightly more likely to play in the playoffs. But it’s probably mostly about how good the pitchers are. Better pitchers, on average, just work with bigger zones than worse pitchers do. Maybe you don’t wish that would be so, under ideal baseballing circumstances, but this is the way the game’s always been. Playoff pitchers more commonly hit their spots. And so they more commonly get the calls. We hoped you liked reading The Playoff Strike Zone’s Always a Little Bit Bigger by Jeff Sullivan! And I forgot that I wrote about this last October. But I don’t think it’s the zone expansion itself that’s that interesting — I think what’s most interesting is the probable explanation.